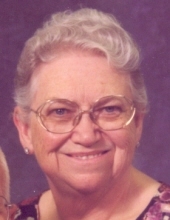 Juanita McCoy, age 83, of Madrid and formerly of Boone, died September 29, 2018 at the Madrid Home in Madrid. Following her wishes, Juanita has been cremated. A time of visitation with the family, will be Friday, October 5, 2018, from 5 until 7 p.m., at the St. Paul’s United Church of Christ, 115 South Cedar Street, in Madrid. Juanita owned/operated McCoy’s Cellar Ceramics in Madrid and Boone for 15 years; worked as a dispatcher for the Boone County Communications Center for 15 years; and worked as a secretary for Boone County Community Services for 12 years. Juanita enjoyed ceramics and playing cards. She and Dean enjoyed camping and they served as camping hosts at the Prairie Flower North Campground at Saylorville Lake. Juanita loved spending time with her grandchildren. In lieu of flowers and in memory of Juanita, memorials may be directed to the family. To send flowers or a remembrance gift to the family of Juanita McCoy, please visit our Tribute Store. "Email Address" would like to share the life celebration of Juanita McCoy. Click on the "link" to go to share a favorite memory or leave a condolence message for the family.